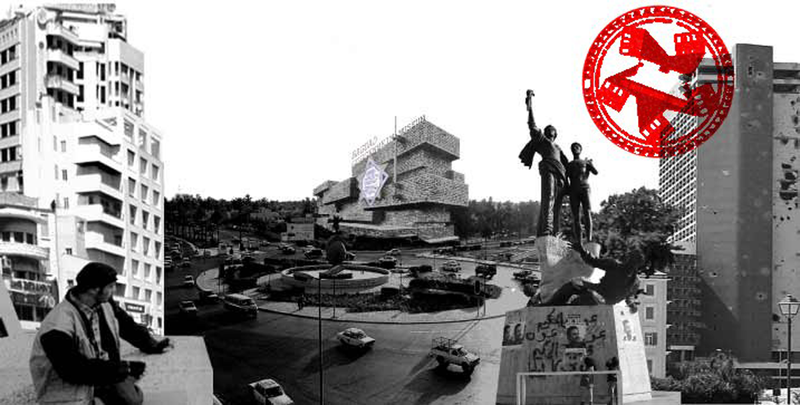 Apparently, one of the main tasks of the Guggenheim Museum building and its annexes around the world is to function as emblematic icons of the powerfulness American culture and of the influential capitalistic global empire. Being in the process of building the Middle East Arab Guggenheim Museum, we tried not to be seduced by this kind of architecture. Practically, we tried to follow a different course of action, having the conviction that a glass façade from the house of the project’s founder could be more appropriate to give an initial direction to shape the model and the character of the building. In his installations Nicos Charalambidis often uses pieces of furniture and structural elements of his apartment, emphasising the ambiguous borders between private and public space. 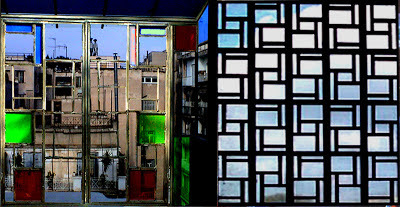 Till today, he has constructed a number of glass facades of different types that being dismantled from his apartment have served as the keystone for his large scale multilayered installations. A scenario of a transportable museum. In 2004,Rauche, a seaside district, not far from the town centre, was considered, the perfect location, to host HAM’s activities. 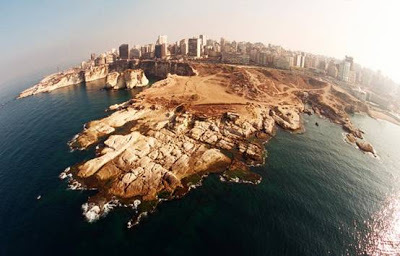 Not only because of its unique location and magnificent view over Mediterranean sea, but also because of being a space charged with the Lebanese historical past. 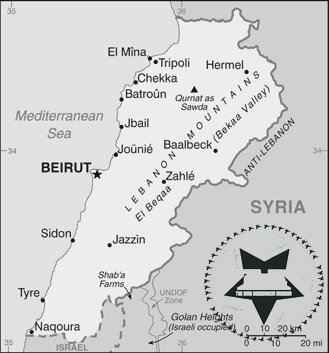 During French colonialism the whole area of Rauche had been the site of a French military camp, which in 1980 had been burnt to the ground by a fire caused by a group of Lebanese partisans. 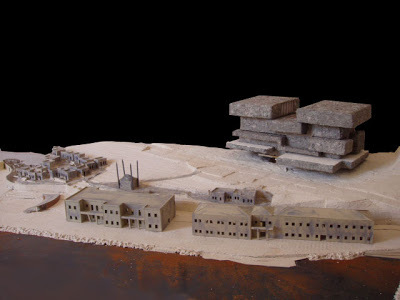 The architect’s proposal focuses on a version of the Mies van der Rohe monument, which he had designed for the city of Berlin (1926) as a memorial to Karl Liebknecht and Rosa Luxemburg and had been dismantled by Hitler in 1933. According to the storyline of this new version of the Arab Guggenheim Museum, the monument is transformed into a transportable building to house its activities. After a period of two year’s program, the structure will be transported to another Arab town in the world Cyprus for another two years and subsequently to other. 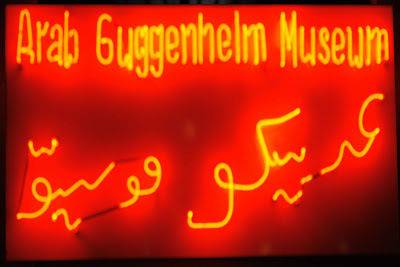 Due to the troubled political situation of the Middle East -and the nearby region -the founder and the shareholders of Guggenheim, have approved the architect’s idea of a portable, wandering museum. The particular Lego-type design of the legendary Mies monument gave to the architect the ideal solution to carrying out the project. Inspired by the constructivist outline of the monument and following its structural boxes as a pattern, a radical building has been formed out of revolutionary ecological materials, which could provide an exceptionally light result to the whole structure. In case of war in the host country, the boxes of the museum can be deconstructed and transported to another Arab country allowing the Arab Guggenheim to continue its cultural tasks. Following a premeditated rearrangement of the boxes, the museum can easily be rearticulated at a significant location, preferably incorporating remnants of the past from each country, buildings, monuments, antiquities etc. 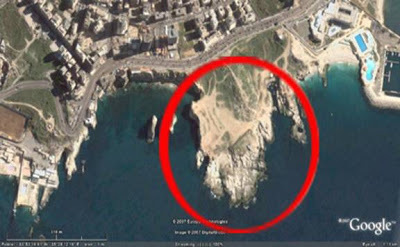 In Beirut, for a case in point, the main building of the museum has been surrounded by a group of out buildings which have been built following the original plans of the demolished quarters of the French military camp; bringing back to life memories of an era that left its indelible mark on Lebanese people. The long central buildings of the camp that in the past had housed the administration and the commandants offices have been converted into a series of versatile workshops for local and invited artists, while the soldiers barracks have been converted into artists’ studios. The construction of the museum had to be such that it could be easily dismantled and transported. It had to be light and easy to reconstruct in any case. The architect thought of using raw materials that could be found in the local area and ended up using sun-dried cow dung along with mud, for the outer skin of the museum. These brick textured panels will be set on metal unfolding structures bound together and based on metal columns and sun dried brick. The row of long central buildings in the camp that served as administration and commander’s offices in the past, have been converted into a series of versatile workshops for local and invited foreign artists, while the soldiers’ barracks have been converted into a block of studios for the artists. 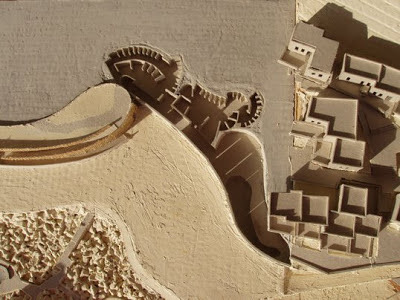 The architect has played upon the former French ruins by creating baths, a swimming pool, changing rooms and an Arabic hammam by excavating the ground, with the guidance of a geologist about the composition of the strata. Thanks to the portability of the museum the structure will be able to peregrinate through the Arab states, raising its cultural influence and protecting the exhibits in case of conflict. 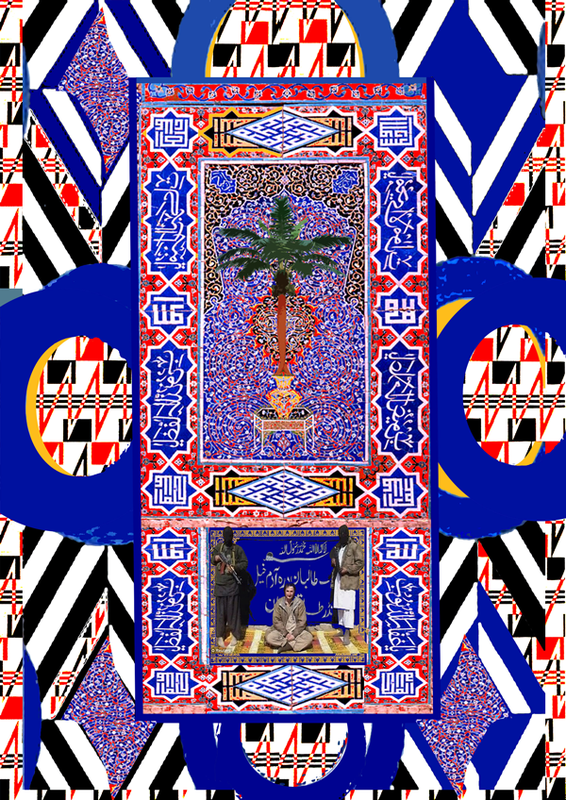 This series of constructions rest on foundations of local history and of course on the daily routine of Arab life. 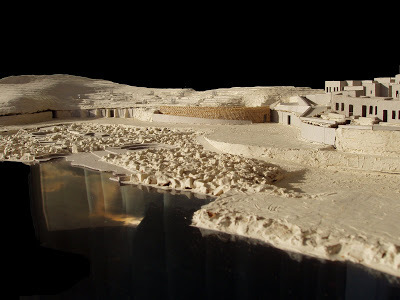 All the excavations and erections that have taken place within the site have been supervised by a special geologist; in direct collaboration with the architect they have confronted the complexity of creating dykes wending through a sea of rocks and connecting with one another through a path made of concrete. The composition inevitably immerses itself in the sea. The galleries of the museum have been camouflaged behind a ramp and a mesh-rope glass façade. 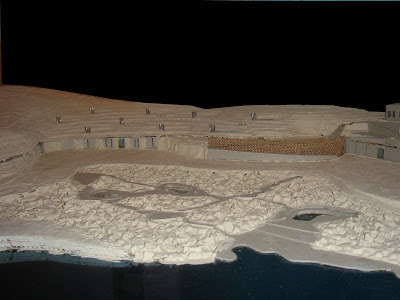 The latter dispels the direct penetration of sunlight, whilst the ramp bridges the path of the procedure from the inception of the concept and its creations within the workshops, to the final phase of its display in the museum, a refreshment café both for the visitors and the artists has been molded to follow the site’s contour lines. On top of the building there are two main units of great importance. The Guggenheim Foundation, apart from having the group of the assistant buildings surrounding the museum, functioning as workshops or studios for artists, thought of having a similar unit incorporated in the main building. This unit’s differentiation is based upon the focus on multimedia practices and computer lab facilities’ usage. 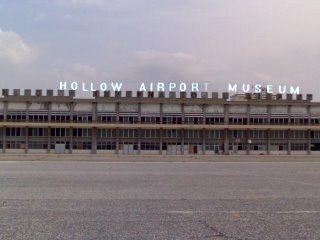 Apart from the equipment offered by the museum, educational programs/seminars on new technology techniques and program use are also going to take place. This happens so as to stimulate local artists’ interest concerning contemporary mediums for art production and encourage them to produce artworks under this new aspect, maintaining though their own distinct local character a point of view. The second unit on top is a cinema/conference-room. It has a capacity of four-hundred people and it is expected to host movie and video festivals, as well as conferences and speeches. It is also going to be used within the framework of educational programs that the museum organizes for schools and universities. Apart from the top units (artists’ multimedia lab and cinema/conference-room) and some other dark rooms for video installations, the remaining 1st, 2nd and 3d floors are made of semi-transparent glass. The rest of the surfaces consist of wooden components. As for the various divisions inside the museum, partitions made out of compressed paper will be used to achieve as light a result as possible. The inner spaces of the museum, particularly the ground level, can be organized to suit specific exhibitions using the compressed paper partitions to create spaces for individual exhibits or group of works. to see this”painting”from the upper levels of the museum. *Starbucks company, as part of its corporate social responsibility (CSR), offered to build a coffee shop into the museum and offer its products at cost prices. Also, in collaboration with the museum, Starbucks is collecting, through its stores all over the world, English books in order to provide local students with such an educational material (literature, art, philosophy, English).